More red, more red, more red!!! 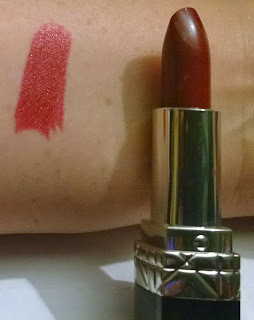 I really am red lipstick obsessed :-) This time, it's the turn of a darker red for Winter time. In celebration of Rouge Dior lipstick’s 60th year anniversary celebrations, Dior have revamped the formula, the packaging and even the shade line-up of their Rouge Dior formulation. Starting with only eight shades sixty years ago, Rouge Dior lipsticks have since then encompassed more than 1,500 shades in total. The current 32-strong shade line-up features both hyaluronic acid (good for hydrating) and a rock samphire extract (good for stimulating cellular renewal) in their ingredient re-formulation, leading to a smoother lip surface that reflects more light and helps make the pigment appear deeper. On top of which, it just looks gorgeous - it's a lovely winter-time red shade. And it feels gorgeous - it's a wonderfully creamy feeling lipstick. Finish-and-looks-wise, it it a lustre finish with a highly pigmented opaque coverage. Lastability-wise, it lasts me about three to four hours. 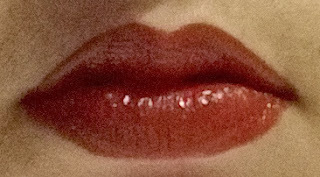 It starts out quite shiny (almost-but-not-quite-glossy) and as it wears, it gradually becomes more matte, but still leaves a decent stain on your lips that seems to more or less fade uniformly. It doesn’t dry out my lips, in fact really seems to hydrate them (that'd be the hydrating ingredients) – even when it’s more matte in appearance (plus several hours later) it doesn’t “feel” matte. It happily lasts me about four-six hours before it’s gone – after four hours it could do with a top-up. For me, as I'm obsessed with reds, and I’d like a darker one for the winter-time, and as as I also don’t like wearing very bright reds for work... I also need to have something that lasts me a half a day before having to top it up – work is a bit mental busy so I don’t have time to be primping and reapplying makeup during the day – I’m lucky if I can do it after lunchtime, just once. 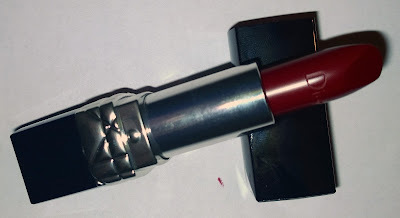 Look here for my Autumn red lippie of choice :-) and here for more information on the Rouge Dior collection of lipsticks.